North Carolina's Wildlife Action Plan (NCWAP) is a comprehensive planning tool developed by the N.C. Wildlife Resources Commission to help conserve and enhance the state’s full array of fish and wildlife species and their habitats. It was developed in cooperation with numerous partners, including federal and state agencies, conservation organizations, and stakeholders.The N.C. Wildlife Resources Commission received approval from the U.S. Fish & Wildlife Service for the comprehensive revision of the N.C. Wildlife Action Plan on March 30, 2016. The 2015 Wildlife Action Plan is available to view online as an ePDF document and can be downloaded using the links provided below. The original 2005 Plan can also be downloaded as a PDF from a link provided below..
Click on the links below to learn more about Species of Greatest Conservation Need (SGCN) or to download North Carolina's WAP. New (2018): the Conservation Registry is now part of NatureServe's Landscope America online mapping tool. Click on the NatureServe Landscope America Map Viewer tab below to learn more and to find a link to the web site. New (2017): click on the Decision Support Tools for Conservation Opportunity Areas (COA) and Threat Assessment tab below to find out more about these two new web-based tools that support priority conservation recommendations in the 2015 NCWAP. If the web interface is unavailable it may be offline as improvements are made. Please check back or bookmark the page and try again if you are not able to access it at this time. If the problem persists please send an email to Cindy Simpson, Wildlife Action Plan Coordinator. New (2016): ArcGIS shapefile data representing statewide 12-digit hydrologic unit code (HUC) priorities can be downloaded from the 2015 Downloads tab below. 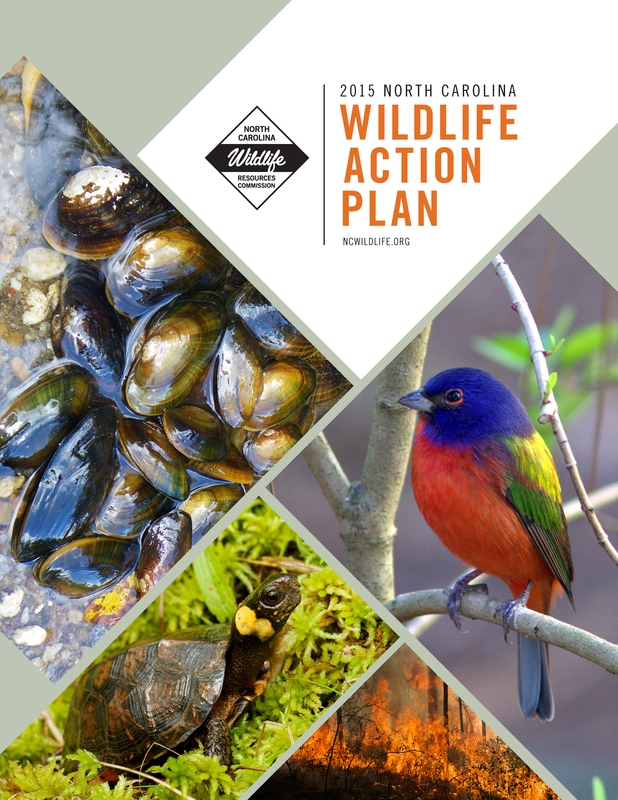 The N.C. Wildlife Action Plan (WAP) is a comprehensive planning tool developed by the N.C. Wildlife Resources Commission to help conserve and enhance the state’s full array of fish and wildlife species and their habitats. It was developed in cooperation with numerous partners, including federal and state agencies, conservation organizations, and stakeholders. The Commission worked with teams of expert biologists statewide to identify fish and wildlife species of greatest conservation need (SGCN) and other species for which there are knowledge gap or management concern priorities. Species identified under the Conservation Concern column are SGCN. Research priority species are identified under the Knowledge Gap column. Management priority species are identified under the Management Concern column. There are 457 SGCN listed in the WAP. This number includes amphibians, birds, crayfishes, freshwater fishes and mussels, mammals, reptiles, and terrestrial and aquatic snails evaluated by Wildlife Action Plan Taxa Teams of species experts. The SGCN also includes species evaluated by others and determined to be a priority for conservation action. North Carolina’s 2015 WAP describes 17 river basins and 40 types of aquatic, wetland, and terrestrial natural communities found across the state that provide important habitat to fish and wildlife. The plan matches each SGCN to the habitat type or river basin where it is found, identifies the most important threats facing each habitat, and details the priority conservation actions required to protect and conserve these species and habitats. State Wildlife Action Plans emerged from a mandate by the U.S. Congress that each state develop a comprehensive conservation strategy to be eligible for federal funding under the State Wildlife Grants program. All 50 states in the U.S. and several territories have developed their own State Wildlife Action Plan (SWAP). Since submitting the state’s first WAP in 2005, North Carolina has received an average $1.3 million annually to support implementation of the conservation actions laid out in the Plan. In large part these funds have been used to support the Commission’s Wildlife Diversity Program, which implements the WAP throughout North Carolina. Two new web-based decision support tools (DSTs) were launched in Spring 2017 to support priority conservation recommendations outlined in the 2015 NC Wildlife Action Plan (NCWAP). They are the Threat Risk Assessment (TRA) tool and the Conservation Opportunity Area (COA) tool. The North Carolina Wildlife Habitat Threat Data Viewer and Analysis Tool is a spatially-explicit decision support tool (DST). It was developed to support state-wide habitat acquisition and management decisions by projecting future probability of occurrence of specific threats in North Carolina relative to terrestrial and aquatic habitats, specifically climate change and urbanization. The TRA tool also uses data sets compiled by USEPA for specific threats that are not projected in time (static, but updated periodically), but whose occurrence on the landscape helps managers gain a more comprehensive idea of threats for any location on the State. The spatial unit for all analyses is based on 12-digit Hydrologic Unit Code (HUC12) sub-watersheds (there are 1,720 in NC). More information about the HUC cataloging system can be found at the US Geological Survey Water Resources web page. The Conservation Opportunity Area DST links Species of Greatest Conservation Need (SGCN) data from the 2015 NCWAP with USGS Gap Program species range data to predict areas with the least amount of protection for wildlife. More information about the SGCN can be found in the 2015 NC Wildlife Action Plan, Chapter 3. The COA tool incorporates SGCN data from NCWAP Appendix H (Habitat Terrestrial Species Associations) by utilizing Excel data to build a relational database with the list of species in the US Geological Survey's Gap Analysis Program (GAP) prediction database. These data identify species associated with regions or natural communities, by protection status, and by conservation priorities as SGCN. Additionally, the list of HUC12 priority areas from NCWAP Appendix J are incorporated for each river basin in the state. The database linkage between SGCN and GAP species range data provides a direct match to 95% of the terrestrial SGCN species (exclusions are subspecies for which there was no direct match). Analysis for aquatic species is not currently included in the DST. These data can then be used to generate a measure of unprotectedness for each habitat guild by sub-watershed. The top five results are highlighted as potential areas for conservation. Downloads - 2015 Wildlife Action Plan. Most links below are PDFs that open to a new window. Acrobat Reader is required. You may download the complete document or sections of interest below. Download entire document (PDF) Download entire document to access appendixes using in-document links. Note: Large download - 34 MB | 1328 pages. The PDFs and Excel files are available to download in compressed ZIP file format - send an email to Cindy Simpson to request a Dropbox link for the download. NOTE: To access the appendixes using in-document hyperlinks, download the entire document. Or download the Appendixes below. In-document hyperlinks to appendixes will not work if only the Table of Contents and Chapters 1-8 are downloaded. Chapter 4 in the 2015 NC Wildlife Action Plan provides more information about these communities and ecoregions. The NC Department of Environmental Quality has designated 17 major river basins in North Carolina. Of these, 11 river basins have headwaters that begin in North Carolina but only 4 are contained entirely within the state - these are the Cape Fear, Neuse, Tar-Pamlico, and White Oak river basins. The other river basins have headwaters that drain across adjacent states (Georgia, South Carolina, Tennessee, Virginia) before crossing North Carolina. While inland freshwater aquatic systems represent a small percentage of the landscape, they are living systems that are influenced by numerous conditions such as landscape position, slope, width, depth, temperature, velocity, substrate or bed material, chemistry, and land cover. The various geology, landscape, and climate attributes found in North Carolina contribute to the wide diversity of aquatic habitats found across the state. The following table provides an overview of the type of natural aquatic communities found in North Carolina and the ecoregions where they occur. For up to date information about these projects and others, download copies of the quarterly Diversity Program reports. A link to the reports is provided at the bottom of this web page. Learn more and how you can help. Many (144 species) freshwater mussels, fishes and crayfishes in North Carolina are listed as threatened or endangered or were identified as priorities for conservation in North Carolina’s Wildlife Action Plan. Surveys to monitor these species and their habitats, as well as searches for new or undiscovered populations, are conducted by biologists throughout the state. Information from these studies is used to guide habitat conservation and enhancement, update the status of imperiled species, revise conservation priorities, and assess the effectiveness of conservation actions. See Wildlife in North Carolina article, “Moving Mussels”. Wildlife Diversity staff monitor bald eagle nests each year to obtain information, such as the number of active nests, along with the number of young fledged per nest. Bald eagles are another example of a collaboration of the Commission, agencies, organizations and landowners that has led to the national recovery of an endangered species. The Wildlife Observation Site on Jordan Lake provides a tranquil location for observing our national bird in addition to year-round wildlife. Wildlife Diversity staff coordinates management of this site, in cooperation with the U.S. Army Corps of Engineers and the New Hope Audubon Society, and helps landowners statewide with guidance and information on how to ensure the continued recovery of bald eagles in North Carolina. Wildlife Diversity staff conduct monitoring studies throughout the state to determine bat distribution and hibernation sites. They use a variety of methods, such as mist netting, trapping, banding and telemetry, to survey and band hundreds of bats. They also work to conserve important roost sites such as caves and mines. 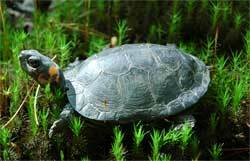 The Commission began surveys for bog turtles in North Carolina in the 1980s to determine the status of populations. Since then, Wildlife Diversity biologists and partners have conducted surveys every year and recorded important information on each captured bog turtle, such as gender, age and shell length. They are working to conserve the rare wetland habitats in the upper Piedmont and mountains that these turtles call home. Wildlife Diversity staff launched a project during 2007 to determine the abundance and distribution of the Carolina madtom, a very small catfish. The madtom is listed as a state-threatened fish and was once abundant in the Neuse and Tar rivers. Biologists’ surveys found the fish is still abundant in the Tar River but is nearly gone from the Neuse River. One of the reasons for the fish’s decline in the Neuse is degraded habitat due to urban development. This suggests that additional care is required if the madtom is going to survive the Tar River basin’s development. Since2007, the N.C. Wildlife Resources Commission mountain region Wildlife DiversityProgram, along with project partners from the N.C. Zoo, collaborators from theN.C. Division of Parks and Recreation, and other agencies, volunteers,universities, etc., began a long-term project to inventory, monitor and assessspecies status in North Carolina. 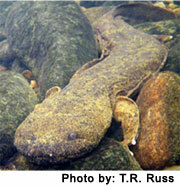 The goals are to study hellbender populationsin the state, revisit historical locations, discover new locations, monitorpopulations and increasing threats to habitats, conduct applied research andeducate the public on hellbender conservation. Wildlife Diversity staff survey and monitor green salamanders in western North Carolina to help determine the status of green salamander populations in the state and direct conservation action. Pigeon River. The Pigeon River was severely polluted by a paper mill for nearly a century. Cleanup efforts reversed much of the damage, but many native fish species had disappeared with no route to recolonize naturally. Since 2003, biologists have been working with partners Blue Ridge Paper, University of Tennessee, N.C. Division of Water Quality and others to restore some of these populations. So far, six fish species —silver, mirror, telescope, striped and Tennessee shiners, and gilt darters — are being reintroduced to their native water. Cheoah River. The Cheoah River had most of its water diverted for hydropower production for more than 70 years. Flow now has been restored but the river is isolated from potential source populations of missing species. Biologists are working now with partners Alcoa, the U.S. Fish and Wildlife Service, the U.S. Forest Service, Virginia Tech and others to restore habitat and species. In 2007, wavy-rayed lampmussels were the first to be reintroduced. A cooperative effort is under way now to restore the spotfin chub, a federal threatened species. The NC Birding Trail was created "to conserve and enhance North Carolina's bird habitat by promoting sustainable bird watching activities, economic opportunities and conservation education." Wildlife Diversity personnel in the mountains conduct research involving trapping, nest box surveys and radio-telemetry of northern flying squirrels to help determine the range of this endangered species. This information will help ensure that our forests are managed in a manner that protects and enhances northern flying squirrel habitat. Between 1984 and 1997, N.C. Wildlife Resources Commission personnel released 92 juvenile peregrines from various cliff sites in western North Carolina. In 1999, peregrines were removed from the federal list of endangered species; however, with such a small population in North Carolina (less than 15 breeding pairs), falcons remain on the state endangered species list. Wildlife Diversity staff coordinate a nest monitoring project, which continues to track the success of restoration efforts and provides guidance to cliff landowners on how to manage these important breeding sites. North Carolina has a new tool for conserving rare and endangered freshwater mussels and fishes! Wildlife Diversity is partnering with the Commission’s Table Rock and Marion fish hatcheries, N.C. State University, the U.S. Fish and Wildlife Service, the N.C. Department of Transportation, the Eastern Band of Cherokee Indians and Conservation Fisheries, Inc., to develop facilities, techniques and the expertise needed to reproduce rare species in captivity. Following successful experiments to hold and propagate mussels, plans are now under way to expand culture facilities for them and rare fishes at the Marion hatchery. This expansion will enable biologists to provide safe refuge for critically endangered mussels during short-term habitat problems (like drought). It also will allow for the production of juvenile mussels and fishes for restoring populations in North Carolina streams and rivers and will support further research to improve and expand these efforts. 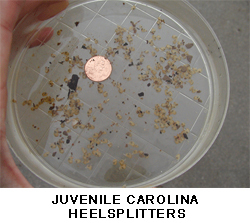 See Wildlife in North Carolina article, “Living with Mussels”. Wildlife Diversity staff work on Commission-owned game lands and with other state and federal agencies in North Carolina to manage public land for the red-cockaded woodpecker. In addition, the Commission has initiated a Safe Harbor Program on private lands to help landowners manage their properties in ways that benefit woodpeckers while ensuring that landowners can utilize their property in compliance with terms of the US Endangered Species Act. This small black-and-white woodpecker, perhaps the most well-known endangered species in North Carolina, uses open stands of pine forests with trees that are 30 years or older for foraging and even more mature trees for nesting. Since 2002, Wildlife Diversity personnel have been principals in a cooperative project tagging and monitoring the robust redhorse, a large sucker that until very recently was thought to be extinct in North Carolina. The robust redhorse is extremely rare and, in North Carolina, is found only in the Pee DeeRiver. Human impacts, such as dam building, pollution and the introduction of exotic species, are likely causes of the fish’s decline. Sea turtle nests are often threatened by beach development, heavy beach traffic, artificial lighting, and various beach re-nourishment activities. Wildlife Diversity staff coordinates the efforts of hundreds of volunteers from individual beach projects along approximately 300 miles of North Carolina's coastal barrier islands. 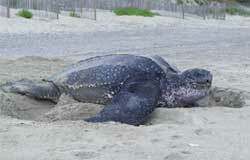 These volunteers monitor nesting activity and report sea turtle strandings. Begun in 2004, the Urban Wildlife Project works to promote open space conservation through land use planning and land conservation in the Triangle Region. This proactive approach steers development away from sensitive wildlife habitat and encourages compact communities with associated connected open spaces. Engage stakeholders on the issue of climate change and wildlife. Garner stakeholder support for and input on using North Carolina’s Wildlife Action Plan as a framework for addressing climate change as it relates to wildlife. This annual event highlights the biology, ecology and conservation needs of reptiles and amphibians around the world. With live animal and educational exhibits, the event offers much to see and learn for people of all ages. Wildlife Resources Commission staff work cooperatively with many different partners and stakeholders to conserve North Carolina’s natural resources. Some of these working relationships span years and involve multiple project efforts, while others represent single or unique opportunities. These descriptions represent only a few of the partnerships Commission staff have been involved with over the years. A broader list is available for download in Adobe PDF format; Click here for a copy of the list. The Albermarle Pamlico Community Conservation Collaboration got underway in 2007 when an extensive group of professionals gathered to share concerns for the natural resources and important wildlife habitats of the Albermarle Pamlico peninsula, especially in light of global climate change. This group intends to explore opportunities to manage lands, restore habitats, and protect lands and waters for the benefit of species native to the region. The Cape Fear Arch includes the watersheds of the lower Cape Fear and the Waccamaw Rivers. The area is under great development pressure, which requires infrastructure that often eliminates habitat for important wildlife species. Since forming in 2006, the mission has been to develop a community conservation vision that provides protection and stewardship of the important natural resources and raises conservation awareness for the area. Numerous state and federal agencies, local land trusts, local conservation organization, county officials, commissioners, planners, and landowners have the common interest of developing a sustainable county focused on the preservation of its natural resources and rural and agricultural heritage. The Conservation Trust for North Carolina protects land and water through direct efforts with willing landowners and in partnership with our state's local and regional land trusts. As a land trust, their protection efforts are focused on mountain streams, forests, and scenic views along the Blue Ridge Parkway. A collaboration between state fish and wildlife agencies, federal resource agencies, academic institutions and private sector conservation organizations working under a Memorandum of Understanding to conserve native Eastern brook trout (Salvelinus fontinalis) and their habitats. The long-term goals of the joint venture are to implement a comprehensive conservation strategy to improve aquatic habitat, raise public awareness, and prioritize the use of federal, state and local funds for brook trout conservation. This partnership centers around the southern, central Piedmont of North Carolina that contains the Uwharries, an ancient mountain range, a series of lakes along the Yadkin-Pee Dee watershed, nationally significant aquatic habitats, rare wetlands, Uwharrie National Forest, Pee Dee National Wildlife Refuge, farmlands, and Piedmont prairie remnants. The mission is to work for the long-term conservation and enhancement of biological diversity and ecosystem sustainability throughout the Greater Uwharries landscape compatible with the land use, conservation, and management objectives of the participating organizations and agencies. A conservation organization whose mission is to facilitate water quality improvements in lakes and streams throughout the upper Hiwassee River watershed within Cherokee and Clay counties in NC. The coalition supports water quality education, watershed restoration projects, watershed planning, and opportunities for citizens to volunteer. The Coastal Land Trust works to protect land, water, and air quality in the Coastal Plain through the acquisition of open space and natural areas, conservation education, and the promotion of good land stewardship. NC Partners in Amphibian and Reptile Conservation (NCPARC) is North Carolina’s own chapter of the successful world-wide organization Partners in Amphibian and Reptile Conservation. Like its parent organization, NCPARC unifies members from all walks of life under one banner; that of the conservation of amphibians and reptiles and their habitats. The program hopes to make a difference for the persistence of healthy amphibian and reptile populations in our state. This initiative, coordinated by Wildlife Resources Commission nongame staff, brings together government, private and public organizations and individuals in an effort to further migratory bird conservation throughout the Americas. Through habitat protection, management, monitoring, professional training and education, this program strives to maintain both bird species and habitats. This Partnership was formed to facilitate collaboration between various federal, state, and non-profit conservation groups for the purpose of conserving the vanishing longleaf pine ecosystem and recovering the federally-listed endangered red-cockaded woodpecker in the North Carolina Sandhills. The goals of this conservation forum include promoting conservation, restoration, health and sustainable use of the landscape and the native terrestrial and aquatic communities that depend, in whole or in part, on the lands and waters of the Onslow Bight area. This regional collaboration works toward conserving saltwater marshes, riverine wetlands, pocosins, longleaf pine savannahs, and other coastal plain ecosystems located between Cape Lookout and the Cape Fear River. 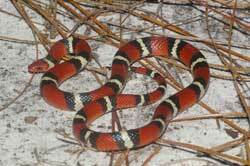 The area also encompasses several large protected areas, including Cape Lejune and Croatan National Forest. NC Partners in Amphibian and Reptile Conservation (NCPARC) is North Carolina’s own chapter of the successful world-wide organization Partners in Amphibian and Reptile Conservation. The members of NCPARC hail from academia, state and federal agencies, research facilities, nature education centers, land trusts, municipalities, zoos, veterinary fields, forest products industries, energy cooperatives, conservation organizations, herpetological societies, pet trade industries, museums, and even your own neighborhoods. The program hopes to make a difference for the persistence of healthy amphibian and reptile populations in our state. A voluntary stakeholder partnership established in 1995 and charged with the overall responsibility for directing the recovery of the robust redhorse (Moxostoma robustum). The partnership is a pioneering effort to recover a species proactively, without federal listing. The partnership operates under a Memorandum of Understanding between state and federal resource agencies, private industry, and the conservation community in lieu of listing this species under the Endangered Species Act. A regional collaboration of natural resource and science agencies, conservation organizations, and private interests developed to strengthen the management and conservation of aquatic resources in the southeastern United States. The mission of this partnership is to protect, conserve, and restore aquatic resources including habitats throughout the Southeast. 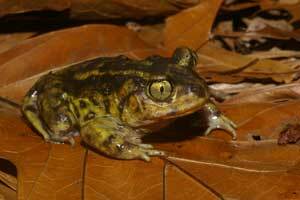 If you are familiar with frog calls, you can volunteer for a route with the Calling Amphibian Survey Program. This is a night survey where you listen for frog calls. The program requires being able to identify frogs by sound, but training sessions are available. To find out more, go to the N.C. Partners in Amphibian and Reptile Conservation website or contact Jeff Hall at Jeff.Hall@ncwildlife.org for more information or to choose a route. 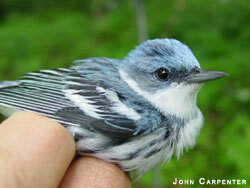 Survey songbird populations by joining the North America Breeding Bird Survey. Coordinators and observers work to identify all breeding birds in their area by sight and sound. 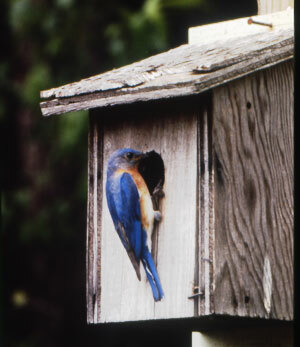 Surveys are conducted annually during the peak of breeding season. Contact Scott.Anderson@ncwildlife.org for more information. There are numerous opportunities for people across the country to engage in numerous citizen science opportunities including Project FeederWatch, the Great Backyard Bird Count, eBird and many others through the Cornell Lab of Ornithology (www.birds.cornell.edu/citsci/). 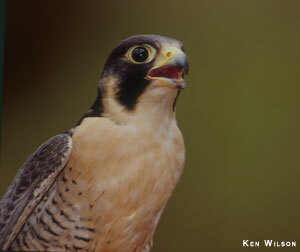 Peregrine falcons nest on cliffs in western North Carolina. Volunteers can help by monitoring cliff sites to document nesting attempts and whether mated pairs produce offspring. Contact Christine.Kelly@ncwildlife.org for more information. The Wildlife Diversity Program monitors songbird populations throughout the year using various methods, including aural surveys and bird banding. One ongoing project is our riparian breeding bird surveys (RBBS), which takes place in several river basins throughout the Piedmont and Coastal Plain from mid-May – late June. These surveys were designed to collect distribution and baseline data for Cerulean, Swainson’s and Kentucky warblers as well as 10 other riparian species. The only requirements for volunteering are a desire to be out on the water looking for birds, the ability to paddle and navigate a canoe, and a reliable vehicle to help shuttle between put-in and take-out locations. This is a great opportunity to hear and see lots of unique birds in rarely visited habitats while simultaneously contributing to our knowledge of bird abundance and distribution in these ecosystems. Contact John.Carpenter@ncwildlife.org for more information about this and other opportunities. T he Wildlife Diversity Program collaborates with the Center for Conservation Biology’s United States Nightjar Survey Network to monitor populations of whip-poor-will, chuck-wills-widow, and common nighthawk. To find out more go to the US Nightjar Survey Network website (http://ccb-wm.org) or for routes in the mountain region, contact Christine.Kelly@ncwildlife.org. Help NCWRC biologists track reptile and amphibian populations by registering with the HerpMapper project and reporting your observations. The Wildlife Diversity Program also works closely with volunteers from the N.C. Herpetological Society to survey, monitor, and conserve bog turtle habitat in North Carolina. Contact Gabrielle.Graeter@ncwildlife.org for more information about bog turtle monitoring and management in North Carolina. There are 22 active sea turtle beach projects along North Carolina’s coastline that monitor sea turtle nesting and stranding in partnership with the North Carolina Wildlife Resources Commission. For information about sea turtle volunteering opportunities at a specific beach or island, contact Matt.Godfrey@ncwildlife.org. Western North Carolina is home to an incredible diversity of amphibians. 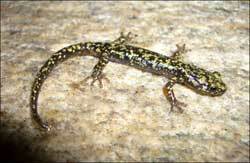 In addition to numerous statewide monitoring projects for amphibians, the Wildlife Diversity Program conducts targeted surveys and monitoring for numerous species including green salamander, hellbender, mudpuppy, and mountain chorus frog. Contact Lori.Williams@ncwildlife.org to find out if you can help in your area of western North Carolina. 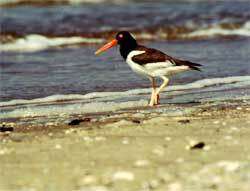 Coastal North Carolina is home to many species of marsh-, shore-, sea-, and wading birds. To keep these species common along our coast, and to monitor rare species closely, the Wildlife Diversity Program conducts seasonal surveys and research, and protects important habitat. If you are interested in assisting with surveys of Piping Plovers, American Oystercatchers, colonial-nesting waterbirds, or other species; ongoing research projects; or habitat protection activities, contact Sara.Schweitzer@ncwildlife.org for more information. 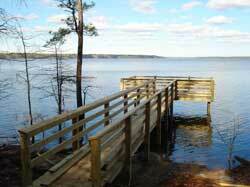 Folks in the Chatham County area can volunteer to be stewards of the Jordan Lake eagle observation area off Martha’s Chapel Road. We need people willing to help pick up trash, develop educational signs, maintain trails, and monitor the area. 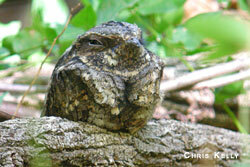 Interested parties can get in touch with the New Hope Audubon Society (Bo Howes, Rhowes@triangleland.org). 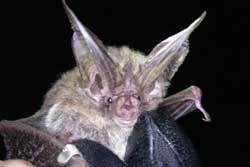 The Wildlife Diversity Program has several efforts underway to monitor North Carolina’s bats (most in the mountains of N.C.), including winter surveys of hibernating bats, surveillance for White Nose Syndrome (a deadly bat disease), long term monitoring at summer habitats, and bat acoustic surveys (NC BAMP – Bat Acoustic Monitoring Program) . Contact Katherine.Caldwell@ncwildlife.org to find out about volunteer opportunities with bats. NatureServe and the National Geographic Society have embarked on a long-term initiative to develop the premier online conservation and educational resource for the land-protection community and the public. LandScope America is a guide to where great places are being protected and conserved for the benefit of everyone. LandScope America uses an interactive map viewer to bring together maps, data, photos, and stories and provides useful tools and resources for strategic conservation planning at a landscape scale and priority-setting. A state-of-the art map viewer is central to your website experience. You can always open the map viewer from any page by clicking on "Go to the Map" near the top of the page. Use your mouse to pan and zoom smoothly from a national view to state and local scales anywhere across the country. All links below are PDFs that open to a new window. Acrobat Reader is required. You may download the complete document or sections of interest below. The State Wildlife Grants (SWG) program was designed to assist states with the conservation of nongame species by providing annual allocations to supplement, not duplicate, existing fish and wildlife programs. These matching funds support work that benefits species in greatest need of conservation; species indicative of the diversity and health of the states’ wildlife; and species with low and declining populations, as designated by the states’ fish and wildlife agencies. In short, the funds are to be used for conservation efforts aimed at preventing wildlife from becoming endangered and keeping common species common. To be eligible for SWG matching funds, each state was required to develop a comprehensive wildlife conservation plan, more commonly known as a state Wildlife Action Plan (WAP or Plan). The NC Wildlife Resources Commission (NCWRC or Commission) is responsible for managing the SWG program and implementing the NC Wildlife Action Plan (NCWAP). Each Plan must address the Eight Required Elements (see Table 1.1 on pages 6-7 in the 2015 Plan) and, at a minimum, be revised at 10-year intervals. This second version of the NCWAP is the result of the collaborative efforts of many federal and state agencies, local organizations, and citizens working on the revision. North Carolina's Plan not only fulfills the requirements set forth by Congress, it also serves as a practical and essential resource for fish and wildlife conservation planning statewide. The North Carolina Wildlife Action Plan (NCWAP) is intended to provide a foundation for State and Federal agencies and other conservation partners to think strategically about their individual roles and coordinate prioritizing conservation efforts throughout the state. At a minimum, North Carolina's Plan will be comprehensively evaluated and revised every 10 years. However, we expect that as new information is discovered about the status of species and natural communities we will need to develop interim updates. You can help us keep the content of the Plan relevant to current issues and needs by sharing your knowledge about the state's fish and wildlife species and their habitats. emerging concerns that have not been addressed in the NCWAP that will impact species or their habitats in North Carolina. These are just a few examples of the types of information we would like for you to share with us. For more information about updates to the NCWAP, contact Cindy Simpson at (919) 707-0227 or send an email to cindy.simpson@ncwildlife.org. Presentations and information from early revision process workshops, including climate change and adaptation measures.